Should Charities Be Protected from the Claws of Fraudulent Transfer Laws? Editor’s Note: As you can see above, NPQ has covered a number of stories in the Nonprofit Newswire about charities that have become involved in Ponzi schemes in one way or another. Some, of course, have invested and either lost their investments or, if they got out early, had profits from investments later clawed back. Some have simply been the recipient of gifts from a bad actor who may have seen charitable gifts as part of the profile needed to gain the confidence of investors. Some of the nonprofits involved in these cases have decided to resist the “clawbacks” of such gifts by advocating for legislation that would protect them from such actions. NPQ would be interested in your thoughts after you read this article by Emily Chan on the state of the law. Time can be of the essence in a Ponzi scheme. The longer a Ponzi scheme persists, the more funds can be lost and the more investors grow, as do the difficulties in tracing those funds for recovery and the hardships to any unwitting beneficiaries required to return the monies at a later date. By the time the curtain is pulled back and the fraud is revealed, the organizers of the Ponzi scheme generally have insufficient funds to return what they took, resulting in a hectic scramble by creditors and victims over the inadequate leftovers that remain. Creditors and victims therefore often look to sources other than the organizers of the Ponzi scheme to recoup their losses. The trustee of a bankruptcy estate may be able to recover some of the estate through a legal action, commonly referred to as a “clawback,” that allows a trustee to recover (i.e., “clawback”) certain transfers of corrupt funds made by the bankrupt debtor to some parties in order to repay other parties such as creditors and victims. Ponzi schemes are particularly susceptible to fraudulent transfer issues because they are, by definition, a mathematically flawed investment fraud in which the organizers use the principal investments of later investors to generate artificial “false profits” for early investors; Ponzi scheme organizers are insolvent from the start in the eyes of the law. [i] Thus, when a Ponzi scheme is revealed, it is not surprising that much of the estate may only be recoverable through clawback lawsuits. Clawback lawsuits date back to the 1920’s[ii] but gained widespread notoriety during the 2009 Bernie Madoff scandal. Irving Picard, the bankruptcy trustee of the Madoff estate, filed suit to recover profits that charities had taken in from their direct investments with Madoff before the Ponzi scheme was discovered. In other words, Picard was seeking return of the profits from “winning” investors (those profits that were distributed from the corrupt fund beyond the principal amount invested) to help recoup the “losing” investors (those that had recovered less than the principal amount invested at the time of the bankruptcy petition). Before Madoff, and certainly after, the legal theories supporting clawbacks of certain fraudulent transfers have been hotly debated. [iii] Recently, there has been increasing attention to another consequence of fraudulent transfer clawback lawsuits: the recovery of donations to charitable and religious organizations by fraudulent actors in a Ponzi scheme, and more specifically, the applicable time period in which a trustee can reach back to recover these donations. Some states are now revisiting the arguments for leniency for charitable organizations, bringing these tensions to a greater boiling point and livening the debate about the appropriate balance between competing positions. Both federal and state law allow for clawbacks of fraudulent transfers. For example, under federal bankruptcy law, a bankruptcy trustee may void and undo a transfer if (a) the transfer involved an actual intent of the debtor to hinder, delay, or defraud; or (b) the debtor received less than a reasonably equivalent value in exchange for such transfer or obligation (in addition to other factors that evidence fraud, such as debtor insolvency at the time of or immediately after the transfer). [iv] A bankruptcy trustee can pursue a clawback action under either federal or state law. [v] States generally impose the same requirements to void a fraudulent transfer under state law but one area where the federal and state law may differ is the statute of limitations, or how far back in time these transfers can be voided by the court. Federal bankruptcy law imposes a two year statute of limitations, while most states have adopted the Uniform Fraudulent Transfer Act with a typical statute of limitations of four or five years. Similar policy considerations are currently underway in Florida to align the state statute of limitations with the two-year limit of federal bankruptcy law. [viii] But state legislative changes reducing the statute of limitations as applied to charitable and religious organizations in clawback lawsuits resulting from Ponzi schemes are unlikely to be adopted without some pushback. On one hand, a shorter statute of limitations on clawbacks from charities provides better protection and predictability to charitable organizations, the vast majority of which may be particularly vulnerable to receiving corrupt funds. First, neither state nor federal law outline specific steps for charitable organizations regarding gift acceptance due diligence; rather, these responsibilities are considered within the general fiduciary requirements of care and loyalty owed to the nonprofit organization under state law and are guided by federal tax principles for maintaining tax-exempt status. Therefore, an organization may employ any number of steps, such as researching the donor, considering mission-consistency, and assessing the reputation effects of accepting the gift. While these steps may catch some bad actors or bad gifts, they are highly unlikely to include scrutiny of the sources of a donor’s charitable contribution, as would be necessary to determine if the gift was the product of a Ponzi scheme. To complicate matters, Ponzi scheme organizers may often target and support charitable or religious organizations with contributions in order to gain standing in society, an enhanced reputation, and goodwill with current or prospective investors. [ix] Additionally, assuming the charity finds no “red flags” and accepts the donation, there is a high likelihood that the money will be spent fairly soon thereafter and would be difficult to recover many years after the fact. The nonprofit sector relies heavily on individual donations and it is no secret that many organizations operate with little to no operating reserves. For some, money in today quickly becomes money out tomorrow to support much-needed charitable programs and services. Furthermore, charitable and religious organizations are unlike other parties that may benefit from fraudulent transfers in that they are subject to state and federal laws that require them to use such assets in furtherance of tax-exempt purposes and not for the private benefit of insiders; this also lends support to the policy argument that charitable and religious organizations are a different kind of recipient than other parties subject to clawbacks that are not required to support charitable ends with those funds. On the other hand, a longer statute of limitations under state law provides at least the option for the trustee to pursue more possibilities for recovering fraudulent transfers, which may be critical for particularly devastating and long-lasting Ponzi schemes. A bankruptcy trustee is generally responsible for administering the bankruptcy estate, including duties to collect and liquidate the property of the estate and to close the estate as quickly as is compatible with the best interests of the interested parties. [x] A shorter statute of limitations can frustrate the trustee’s ability to more fully recover the assets of an estate, and it is the creditors and victims who ultimately pay the price. Narrowing the door for recovering funds from charitable and religious organizations, some of which may be far richer than many of the creditors and victims, may have a substantial impact on the overall recovery by the trustee because charities are common targets for fraudulent transfers by Ponzi scheme organizers. Additionally, legal theories such as unjust enrichment may furthermore support the premise that even innocent recipients of corrupt funds, including charitable and religious organizations, must return those gains. [xi] Whether the funds were used for charitable purposes may bring little to no satisfaction to innocent investors who watch others benefit from the windfall of their ill-gotten money. The current discussions taking place in state legislatures and the potential effects on victims and charities illustrate the many open-ended policy questions involved in balancing the desire to minimize hardships to charities and the desire to recoup losses for victims in the wake of a Ponzi scheme. Despite the recent policy victory for nonprofits in Minnesota, the nonprofit sector should understand that it is not immune to the paths of destruction created by the Madoffs and Petterses of the world. Emily Chan is an attorney with the NEO Law Group, a San Francisco-based law firm focused on representing nonprofit and tax-exempt organizations. She is also principal contributor to the Nonprofit Law Blog. [i] See Cunningham v. Brown, 265 U.S. 1, 8 (1924). [iii] See, e.g., Cherry, Miriam A., Wong, Jarrod, Clawbacks: Prospective Contract Measures in an Era of Excessive Executive Compensation and Ponzi Schemes, 94 MINN. L. REV. 368 (2009); Macchiarola, Michael C., In the Shadow of the Omnipresent Claw: In Response to Professors Cherry & Wong, 95 Minn. L. Rev. Headnotes 1 (2010). [iv] When the debtor receives less than a reasonably equivalent exchange, the Bankruptcy Code also requires that the debtor “(I) was insolvent on the date that such transfer was made or such obligation was incurred; (II) was engaged in business or a transaction, or was about to engage in business or a transaction, for which any property remaining with the debtor was an unreasonably small capital; (III) intended to incur, or believed that the debtor would incur, debts that would be beyond the debtor’s ability to pay as such debts matured; or (IV) made such transfer to or for the benefit of an insider, or incurred such obligation to or for the benefit of an insider, under an employment contract and not in the ordinary course of business.” 11 U.S.C. §548(a)(1)(B). [vi] Contributions to charitable and religious organizations by the fraudulent actor are considered transactions involving constructive fraud unless: “(A) the amount of that contribution does not exceed 15 percent of the gross annual income of the debtor for the year in which the transfer of the contribution is made; or (B) the contribution made by a debtor exceeded the percentage amount of gross annual income specified in subparagraph (A), if the transfer was consistent with the practices of the debtor in making charitable contributions.” 11 U.S.C. §548(a)(2). [vii] Chapter 151 (H.F.No. 1384), Section 513.41. [viii] See S.B. 458; see also The Florida Senate Bill Analysis and Fiscal Impact Statement, Bill CS/SB 458 (Feb. 7, 2012). [ix] See, e.g., Wilkins, Anne M., Acuff, William W., Hermanson, Dana R., Understanding a Ponzi Scheme: Victim’s Perspective, Journal of Forensic & Investigative Accounting, Issue 1 (2012) (“The interviewees mentioned charitable works most often as an influence on their decision to invest. A significant number also mentioned religion, charisma, special expertise in trading foreign currency, and an appearance of wealth or credibility.”). 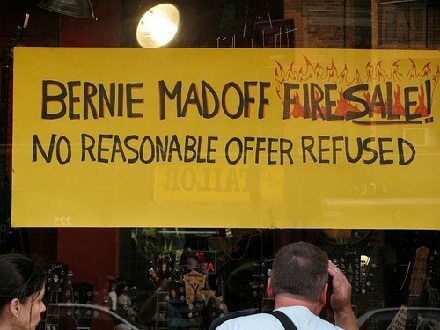 [xi] See, e.g., Sepinwall, Amy J., Righting Others’ Wrongs: A Critical Analysis of Clawback Suits in the Wake of Madoff-Type Ponzi Schemes and Other Financial Frauds (March 2012). [xii] Phelps, David, “Minnesota nonprofits get break on clawbacks,” StarTribune (April 4, 2012). [xiii] Minnesota Council of Nonprofits, “House File 1348 Signed by Governor: A Victory for All Minnesota Nonprofits,” Press Room (April 4, 2012). [xiv] United States v. Petters, Government’s Response Regarding Sentencing (April 1, 2010).